Born at Yorkshire, England, he was persuaded at the age of eighteen by Reverend Richard Young of St. Andrew’s to come to Canada. He stayed at St. Andrew’s for a time and then entered St. John’s College where he took an Arts degree and studied theology. 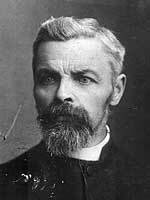 He was ordained deacon in 1879 and in that year was sent to the Sioux Reserve near Griswold to establish a mission. In 1880, he was married to a daughter of HBC Factor Samuel Taylor. They had one adopted son, W. Burman. He continued in his ministry to the Sioux for ten years, became fluent in the Sioux language and very knowledgeable in the Indian work of the Church. He was for many years convener of the special committee of the Provincial Synod of the Anglican Church of Indian missions. He was the first rural dean of Brandon, appointed in 1886. He organized and was the first head of the Rupert’s Land [Indian] Industrial School at Middlechurch. From there he went to St. Peter’s mission, Selkirk Avenue, Winnipeg, which soon became a flourishing parish. Failing health forced him to give up parish work, and in 1903 he was appointed steward and bursar at St. John’s College, where he had for some time been lecturing in botany and Biblical literature. He had a wide reputationas a botanist and was for many years examiner in botany for the University of Manitoba. He was the founder of the Forestry and Horticultural Association of Manitoba which, among other things, promoted the planting of shelter belts around prairie farmsteads. He served as MHS President from 1899 to 1901. Burman died in Winnipeg on 30 January 1909. There are papers at the Rupert’s Land Archives and at the Archives of Manitoba.